In drought-hit Bundelkhand, corruption is not just a tired cliché from a bad Bollywood movie, it is a life-threatening human rights emergency. Corruption exacerbates poverty in Bundelkhand…the money earmarked for NREGA is being cleverly pocketed by village council leaders and unscrupulous officials. Sesame shoots in the fields of Bundelkhand make it seem there is no drought. But the crops are stunted and useless. Bundelkhand, which comprises six districts in Madhya Pradesh and seven in Uttar Pradesh, has had a drought for seven years except the last one. At the peak of farming season this year, rains were half of normal. In between Mahoba and Chhattarpur districts lies Khajuraho airport. Swanky roads and five-star hotels dot the tourist destination and belie the silent human catastrophe unfolding just kilometres away. Drought may have ravaged the fields but State apathy and the brazenly corrupt officials are more brutal. Eighty-five-year old Motiya, slumped on a cot, gives out a heartrending cry as we step into his dingy hut. His wife sleeps nearby. Both have had fever for four days. Motiya has bed sores and can barely move. Villagers say that often worms crawl out of his mouth. “The other day my father defecated in bed. I cleaned him up. Where is the money to get them medicines?” asks Motiya’s son Chaniya, a daily-wage labourer in Seelaun village of Chhattarpur. The government hospital is 25 km away, and rarely stocks medicines. Cattle, abandoned on highways, and the old are among the causalities of this drought as families flee a disaster. In village after village, elders have in vain applied for pension that provides Rs. 275 a month. Often the local officials demand bribes from penniless petitioners. Also, families who own more than five acres of land are not classified as being Below Poverty Line or BPL. It does not bother the officials that the drought has rendered income from land inadequate. Dalit woman Jhharokhan Paswan in Chandauli village of Mahoba could not complete the last rites of her husband who died of grinding hunger last year. “My blind husband died a slow painful death,” she says. A tattered sari covers her old body. Had the grain bank supported by ActionAid partner organisation Kriti Shodh Sansthan not given her 40 kg of wheat, she would have had to go on begging. Last month, she threw a dried-up chapatti on the district collector’s table. He promised to mark her as BPL. And she is still waiting. Despair is all too common in Bundelkhand. Rani’s husband Priti Pal Singh jumped into a well in Chandauli three months back. Their three acre land had stopped yielding, and he couldn’t repay a loan of Rs. 80,000 he took for his daughter’s wedding. Rani has asked for a job but the sarpanch argues over how an upper caste woman can go to work! Though only slightly better-off, villagers have been generous enough to offer food. “I dread to think what will happen if they stop. Sometimes I too feel like jumping into the well,” her voice falters. Nights spent listening to her children crying out of hunger are still fresh in her memory. Corruption exacerbates poverty in Bundelkhand. The running of the National Rural Employment Guarantee Act or NREGA is an example. The scheme that promises 100 days’ work could have been a lifeline for rural families. But the money earmarked for it is being cleverly pocketed by formidable village council leaders and unscrupulous officials. NREGA wages have not been paid to 200 people of Akauna village in Chhattarpur for eight months. Officials have yet to answer queries posed in March under the Right to Information Act on how many villagers got jobs in Akauna. Eighty villagers in Seelaun are yet to get remuneration. In village after village, inhabitants underline that those who are close to the panchayat leaders get NREGA work or a BPL tag. Village council heads often refuse to accept written applications. Hence, little evidence remains of how many rural folk sought jobs and how many got them. The Afforestation Mega Campaign in Uttar Pradesh — a scheme worth Rs. 1582 million — was launched last year to boost the NREGA in drought-prone Bundelkhand. Mahoba was supposed to get 10 million saplings. “Only 40 per cent of the saplings have been sown, the rest are on paper,” reveals Manoj Kumar of Kriti Shodh Samsthan. Six rivers have gone waterless in Mahoba. So, without food, water and jobs, people have no choice but to migrate to metropolises. Chhattarpur Collector E. Ramesh Kumar was quoted in The Hindudated September 5, “This is not distress migration.” He attributed the movement to seeking better opportunities. “In Delhi we live in plastic huts next to roads. At times we fall from high rises doing construction work. Does that sound like a better opportunity?” asks Ramlal. Ramesh Kumar, in a telephonic exchange, says he is only a few months old in Chhattarpur. And that “some shortcomings” perhaps do affect some villages. The distance between Bundelkhand’s poor and their political leaders is huge. Asked whether elected representatives have visited them ever since the polls, there are laughs all around in Chandauli. Even as Finance Minister Pranab Mukherjee has said the country has enough food stored to prevent high inflation, hunger is widespread in Bundelkhand. Those who are entitled to subsidised grains in Seelaun assert the full quota of 35 kg hardly ever reaches them. Numerous people across villages wryly confess that their meals consist of chapattis and salt. Bangle seller Ramesh Lakhera says, “I remember the taste of dal.” Lakhera’s earnings have plunged, and lentils cost a steep Rs. 90 per kg. “Nearly 65 per cent of families are malnourished in 500 villages of Mahoba,” says Manoj Kumar. In Banda district, 48 per cent of the children aged three or less are underfed. Government records reveal there are 130,000 malnourished children in Chhattarpur and 600 in Tikamgarh district. However grim these statistics may be, there’s more. “We have discovered 40 undernourished children in Kandva village of Tikamgarh who have not been mentioned in anganwadi registers. 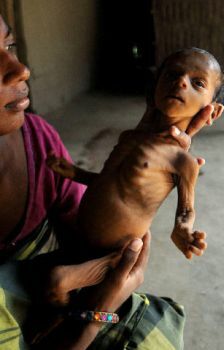 Ten are severely malnourished,” says Narendra Sharma of ActionAid. Government-supported anganwadis supposedly provide nutritious food to toddlers and pregnant women. In Mahoba, 165 anganwadis don’t function at all. Meanwhile, the state website proudly announces “the historic decisions including increase in the budget for the welfare of Dalits and tribals by 41per cent”. The author is a development journalist based in New Delhi and Hyderabad. India’s food and water security systems will be the worst victims of a rise in mean temperature. Building our defences against potential climate change activated calamities through mainstreaming climate resilience in all developmental programmes should be the priority task in the New Year. The principle of common but differentiated responsibilities is the core of the many climate agreements arrived at so far, including the Kyoto Protocol (1997) and the Bali Plan of Action (2007). The differentiated responsibilities aim to meet the special needs of developing countries for accelerated and equitable economic development. Both at L’Aquilla and Copenhagen, the industrialised countries proposed limiting the rise in mean temperature to 2 degrees C above norm al. Even this seems to be unattainable in the context of the present rate of emission of greenhouse gases (GHG). Hence, the principle of common but differentiated impact of 2 degrees change in mean temperature is essential for prioritising climate victims. For example, small islands like Tuvalu in the Pacific Ocean, the Maldives, Lakshadweep and the Andaman and Nicobar, as well as Sunderbans in West Bengal, Kuttanad in Kerala and many locations along the coast will face the prospect of submergence. Floods will become more serious and frequent in the Indo-Gangetic plains. Drought induced food and water scarcity will become more acute. South Asia, Sub-Saharan Africa and the small islands will be the worst victims. In contrast, countries in the northern latitudes will benefit due to longer growing seasons and higher yields. Addressing the World Climate Conference in Geneva in 1989 on the theme, “Climate Change and Agriculture,” I pointed out the serious implications of a rise of 1 to 2 degree C in mean temperature on crop productivity in South Asia and Sub-Saharan Africa. An Expert Team constituted by FAO, in its report submitted in September 2009, also concluded that for each 1 degree C rise in mean temperature, wheat yield losses in India are likely to be around 6 million tonnes per year, or around $1.5 billion at current prices. There will be similar losses in other crops and our impoverished farmers could lose the equivalent of over $20 billion in income each year. Rural women will suffer more since they look after animals, fodder, feed and water. We are now in the midst of a steep rise in the prices of essential food items like pulses. 2009 has been characterised by both extensive drought and severe floods. The gap between demand and supply is high in pulses, oilseeds, sugar and several vegetable crops including onion and potato. The absence of a farmer-centric market system aggravates both food inflation and rural poverty. FAO estimates that a primary cause for the increase in the number of hungry persons, now exceeding over a billion, is the high cost of basic staples. India unfortunately has the unenviable reputation of being the home to the largest number of undernourished children, women and men in the world. The task of ensuring food security will be quite formidable in an era of increasing climate risks and diminishing farm productivity. China, which was reluctant in Copenhagen to join other developing countries in efforts to restrict the rise in mean temperature to 1 to 1.5 degrees C, has already built strong defences against the adverse impact of climate change. During this year, China produced over 500 million tonnes of foodgrains in a cultivated area similar to that of India. Chinese farmland is, however, mostly irrigated unlike in India where 60 per cent of the area still remains rain-fed. Food and drinking water are the first among our hierarchical needs. Hence while assessing the common and differentiated impact of a 2 degree rise in temperature, priority should go to agriculture and rural livelihoods. What are the steps we should take in the fields of both mitigation and adaptation? The largest opportunity in mitigation lies in increasing soil carbon sequestration and for building up soil carbon banks. Increase in the soil carbon pool in the root zone by 1 ton C/ha/yr will help to increase food production substantially, since one of the major deficiencies in soil health is low soil organic matter content. There should be a movement for planting a billion “fertilizer trees” which can simultaneously sequester carbon and enhance soil nutrient status. We can also contribute to the reduction in methane emission in the atmosphere from animal husbandry by spreading biogas plants. A biogas plant and a pond on every farm will make a substantial contribution to both reducing GHG emission and ensuring energy and water security. Similarly neem-coated urea will help to reduce ammonia volatilisation and thereby the release of nitrous oxide into the atmosphere. 2010 is the International Year of Biodiversity. We can classify our crops into those which are climate resilient and those which are climate sensitive. For example, wheat is a climate sensitive crop, while rice shows a wide range of adaptation in terms of growing conditions. We will have problems with reference to crops like potato since a higher temperature will render raising disease-free seed potatoes in the plains of northwest India difficult. We will have to shift to cultivating potato from true sexual seed. The relative importance of different diseases and pests will get altered. The wheat crop may suffer more from stem rust which normally remains important only in Peninsular India. A search for new genes conferring climate resilience is therefore urgent. — Establish in each of the 127 agro-climatic sub-zones, identified by the Indian Council of Agricultural Research based on cropping systems and weather patterns of the country, a Climate Risk Management Research and Extension Centre. — Organise a Content Consortium for each centre consisting of experts in different fields to provide guidance on alternative cropping patterns, contingency plans and compensatory production programmes, when the area witnesses natural calamities like drought, flood, higher temperature and in case of coastal areas, a rise in sea level. — Establish with the help of the Indian Space Research Organisation (ISRO) a Village Resource Centre (VRC) with satellite connection at each of the 127 locations. — Establish with the help of the Ministry of Earth Sciences and the India Meteorological Department an Agro-Meteorological Station at each Research and Extension Centre to initiate a “Weather Information for All” programme. — Organise Seed and Grain Banks based on Computer Simulation Models of different weather probabilities and their impact on the normal crops and crop seasons of the area. — Develop Drought and Flood Codes indicating the anticipatory steps necessary to adapt to the impact of global warming. — Strengthen coastal defences against a rise in the sea level as well as the more frequent occurrence of storms and tsunamis through the establishment of bio-shields of mangroves and non-mangrove species. Also, develop seawater farming and below sea-level farming techniques. Establish major research centres for sea-water farming and below sea-level farming. Kuttanad will be a suitable place for the Below Sea-Level Farming Research and Extension Centre. A major centre should also be established in the Sunderbans area. — Train one woman and one man of every panchayat to become Climate Risk Managers. They should become well-versed in the art and science of Climate Risk Management and help to blend traditional wisdom with modern science. The Climate Risk Managers should be supported with an Internet-connected Village Knowledge Centre. Today (December 26, 2009) marks the fifth anniversary of tsunami. The tsunami of 2004 was a wake-up call alerting us to the consequences of a sudden rise in the sea level. The “Copenhagen Inaction” will lead to more severe coastal storms, tsunamis and sea level rises. A Climate Literacy Movement as well as anticipatory action to safeguard the lives and livelihoods of all those living in coastal areas and islands will have to be initiated. Integrated coastal zone management procedures involving concurrent attention to both the landward and seaward site of the ocean and to coastal forestry and agro-forestry as well as capture and culture fisheries are urgently needed. With the help of Tata Trusts, the M.S. Swaminathan Research Foundation is dedicating today to fisher and coastal communities a “Fish for All Research and Training Centre” at Kaverpoomipattinam (Poompuhar) for imparting training from fish capture to consumption. A college for coastal communities is also being established with the help of the Indira Gandhi National Open University. Artesenal fishermen going to the sea in small boats are being provided with cellphones which can give them information on wave heights and the location of shoals. This helps not only to save time but also allay fears concerning a sudden rise in the sea level. In 2010, India will complete 60 years of planned development. Hereafter, climate resilience must be mainstreamed in all development programmes. Let not the Copenhagen Inaction add to the number affected by deprivation and malnutrition.